by Nicolas Cheviron. AFP. Sunday, January 16, 2010. Terrorised by mounting extremist attacks, more and more Iraqi Christians are fleeing in panic to neighbouring Muslim-majority Turkey, among them lone minors sent away by desperate parents. In Istanbul, a tiny Chaldean Catholic community has embraced the refugees, serving as their first point of shelter before the United Nations or local civic groups extend a helping hand. The number of arrivals, available statistics show, has sharply increased since October 31 when gunmen stormed a Baghdad church, killing 44 worshippers, two priests and seven security guards, in an attack claimed by Al-Qaeda's local affiliate. "We saw many newcomers after the attack. We saw they had made no preparation and had no savings," said Gizem Demirci, an activist at the Association for Solidarity with Asylum-Seekers and Migrants. "Moreover, we began to receive minors... whose families are still in Iraq but had just enough money to send away a son or a daughter," she added without offering any specific figures. The violence prompted an emergency summit by Iraq's top Muslim clergy in Copenhagen this week that issued a fatwa Friday that "condemns all atrocities against the Christians," said Andrew White, a participant and British vicar at St. George's Church in Baghdad. The Shiite and Sunni religious leaders, who gathered at Denmark's initiative, urged Baghdad to criminalise inciting religious hatred and to "put the issue on the agenda of the next Arab Summit" to be held in the Iraqi capital in March, White told AFP in Copenhagen. In Istanbul, among the newest refugees is 21-year-old Sandra, whose family fled Baghdad in mid-November, alarmed by the church carnage and ensuing threats by Islamist extremists. Christians represent less than two percent of the population in Muslim-majority Iraq. "Some of our neighbours were killed in that attack," Sandra told AFP at the Chaldean Catholic Church in Istanbul. "At any time, it would have been our turn, the turn of our church." Her father, a cook, made the decision to flee when the family felt the menace had reached their doorstep. "We were at home with my mother and sister. At about 10:30 pm, some men stormed in and made us lie down. They told us: 'Either you become Muslims or you go. Otherwise we kill you'," Sandra recounted. In her dreams, Australia is the final destination in a journey to a new life. Going back home is not even an option. "Going back to what? Getting killed?" she grumbled. For Israel Hannah too, Iraq is now a lost homeland after an arson burnt down his grocery, destroying also any remaining resolve he had to stand strong and carry on. The 61-year-old looks forward to a new start, probably in North America or Australia, as he already savours the little joys of tranquil life in Istanbul, where a modest, tiny flat accommodates his five-member family. "You feel free any time. You go to church at any time on Sundays, or you visit this or that. We feel safe and we are thanking God," he said, still astonished at having celebrated Christmas in broad daylight, amid Muslim neighbours. The Chaldean Catholic Archbishop of Istanbul is alarmed over the rising number of refugees, stressing they now come even from the country's relatively peaceful Kurdish-majority north that used to serve as a safe haven. But Archbishop Francois Yakan said some southern Iraqi Christians who had fled to the north no longer feel safe there, either. 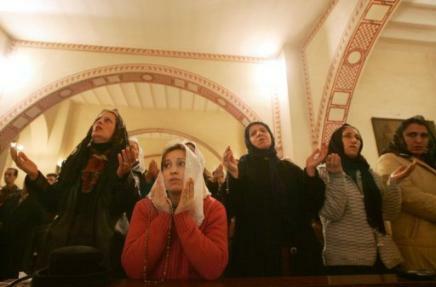 According to church records, some 150 Christian families, or more than 600 people, arrived in Turkey in December, almost the same as during the whole of 2009. "What worries us is that Christians in northern Iraq too are now scared. There are now people who come from Arbil, Zakho and Sulaimaniyah," the archbishop said, referring to three cities in Iraq's Kurdish autonomous region. "These are people who lived in peace previously," he said. For migrants' activist Demirci, the October bloodshed at the Baghdad church was the landmark event that fuelled the exodus. "They were scared and left just like that," she said of the Iraqi Christians. Figures by the Turkey office of the UN High Commissioner for Refugees tend to confirm the trend: the number of asylum applications by Iraqi Christians has more than doubled in three months -- from 183 in October to 428 in December.